Woo! It’s Friday! It’s always a nice feeling knowing that the weekend is here, even though for us in the bridal industry, the weekend means busy! But hey, helping our brides pick their dresses for their big day keeps us busy and we love that! So here you are, engaged because your guy has finally popped the question. You’re planning your wedding and some of you may have already planned it all out from the perfect dress all the way to the place cards on the tables. I’m sure we can thank Pinterest for that, it’s addicting! But today, lets talk about the girls who are by your side throughout the whole wedding madness, your bridesmaids. If you already know who your bridesmaids will be, great! If not, you have some time to figure it out so don’t sweat it and maybe this post will even help you decide! These days people are being so creative with their weddings. So why not make your favorite girls feel special and ask them in a creative way to be your bridesmaids? I’ve created the ultimate list of bridesmaids’ proposals for you to do just that! Want something small, but still cute? This one's for you then! Put a ring pop inside the box with a note that says, “Now it’s my turn to pop the question, will you be my bridesmaid?” It’ll be sure to make your girls smile, and it’s even a tasty treat! Want to make them laugh? A witty card seems like the perfect idea for that! What about some jewelry to make them sparkle and shine? You can even have all the girls wear it on your wedding day! Want to ask them in a really sweet way? This one not only does that but it's a sweet treat for them to eat after they say yes! What them to definitely say yes? This box of goodies will give them lots of reasons to! Want something for your wine loving girls? These are just absolutely perfect for them!! Or maybe your girls will need something a little stronger? So many choices, I know, but any of these would be perfect for you to ask your favorite girls to be your bridesmaids! So which one of these do you brides out there just love? 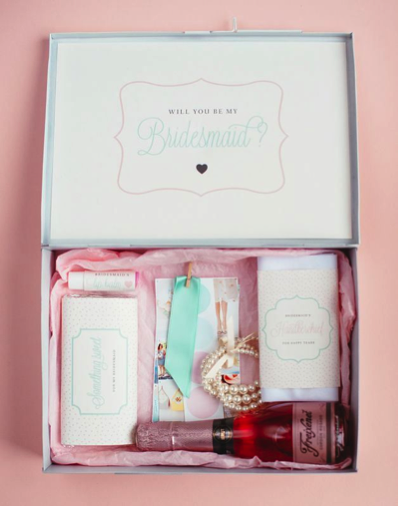 Share with us, by commenting below how you asked your girls to be your bridesmaids!